Figuring out how to afford college may be one of the most stressful parts of attending school for some people. But don’t worry, we’ve got some great tools to help students like you make paying for college a reality. As a resident of Illinois, you can apply for state-specific financial aid, as well as federal funding. From state programs, like the Monetary Award Program or the Golden Apple Scholars of Illinois, to federal financial aid through the FAFSA, there are many resources that can be key in helping to pay for tuition. Let’s look at some college funding options that Illinois residents should explore. The first step to finding financial support for college is filling out the FAFSA (which stands for the Free Application for Federal Student Aid). Completing the FAFSA submits your application for federal financial aid, as well as some scholarships and grants that might apply to you (without having to submit a separate form). This is why it should be your first step in figuring out how to pay for college. We will admit, the downside of having to fill out the FAFSA is that the form is complicated and can be frustrating. However, we have a comprehensive guide that will help get you through each question without pulling out your hair! And remember, you should submit the FAFSA as soon as you can (it is available in October the year before you go off to college). Some scholarships and grants require a separate application, and are not included in the FAFSA. These financial opportunities may be more difficult to find, which is why we’ve listed some that might be directly applicable to you. Minority Teachers of Illinois Scholarship Program provides up to $5,000 per year to minority students who are dedicated to pursuing a career as a teacher at a nonprofit Illinois school. Nursing Education Scholarship Program gives financial aid to students who want to become nurses in Illinois. Golden Apple Scholars of Illinois is offered to academically gifted students, and particularly minority students, who are interested in teaching after college in high-need areas of Illinois. In addition to scholarships, you might be eligible for state grants. Monetary Award Program helps students who are in great financial need afford college. Illinois National Guard (ING) Grant Program gives financial support to members of the Illinois National Guard who are pursuing a degree at a two- or four-year public college. Higher Education License Plate (HELP) Program is a grant that offers select students financial aid from schools that have special collegiate license plates— all proceeds of the license plates go to this program. For more information on state funding for college, you can check out the Illinois Student Assistance Commission. While the state of Illinois has many financial aid opportunities available for residents considering higher education, it is always a good idea to check for local and national scholarships that you can apply for. You can also find scholarships through the schools that you apply to, so it’s a good idea to check out their financial aid webpages. For example, the University of Illinois at Chicago offers need-based and merit-based scholarships for accepted students. And according to their financial aid website, 70% of their students have part-time employment to help offset the costs of college. Similarly, Northwestern University offers extensive financial aid based on financial need and academic achievements, awarding over $144 million to undergraduates in the 2016-2017 school year. Some of these scholarships include the Founders Scholarship, which offers, on average $13,200 to highly achieving students from middle class families. The Good Neighbor, Great University scholarship gives financial aid to accepted students that graduated from high schools in Evanston and Chicago. Also, make sure to research if there are any local scholarships available that you might be able to apply for. Many local organizations throughout the country provide opportunities for scholarships. You may even be eligible for a specific scholarship based on your personal interests. 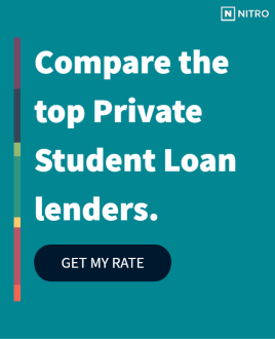 Once you have exhausted all other options, it’s time to think about applying for a private student loan. Taking out a loan is a big commitment and you want to make sure that you get the best rates available. That’s why we’ve found the best private student lenders that can help you pay for the rest of your tuition. You can also use our NitroScore Tool, which will help you get a good idea of what your financial situation will be after you graduate based on your school, major, and any financial support you anticipate receiving. We know that trying to finance your education is overwhelming. But now that you’ve read through all the steps, you can be confident that you are ready to begin the process of planning your future!